Last week saw a big three-day council meeting filled with all sorts of exciting developments. I’ve added four votes to the City Council Scorecard. By my count, Council has now considered 17 major items since their term began in December. In other exciting developments, I’ve finally published the scorecard as a Google Spreadsheet for easier viewing. PW3.1 — The garbage issue, pertaining to solid waste collection west of Yonge Street and litter collection in parks. While initially written as an all-in-one motion that would see council vote to both send a contract out to tender and automatically approve the best bid through the Bid Committee, the mayor and his team conceded to their opponents prior to the meeting and promised to amend the item. As passed, the item is an invitation to the private sector to submit bids. Council will then examine their numbers versus the status quo, and determine how to best proceed. MM8.6 — The motion that killed the Fort York bridge. Sticklers and apologists will tell you that the bridge wasn’t killed when Councillor Mike Layton’s motion to reintroduce the item to council failed to achieve a two-thirds majority vote, but they’re being pedantic. The outcome of this vote means that it will likely be 2015 before anything gets built, which is a lifetime in political terms. EX5.3, Motion 1a — The ultimate outcome of the mayor’s attempt to eliminate citizen advisory committees was delayed by a month, as motions to save many of the committees on the chopping block were referred to the mayor’s office. Staff will report back at the next council meeting, at which time we’ll learn which of them — if any — will survive. One committee that will definitely live on is the Aboriginal Affairs Committee, as Layton was successful in passing a motion that saved the group, despite the objections of Mayor Ford. A relatively minor vote compared to others on the scorecard, but important because it was a major defeat for the mayor. PW3.5, Motion 1 — In an item relating to the treatment facility at Ashbridges Bay, Councillor Gord Perks moved an amendment that would see the city move toward using environmentally-friendly ultraviolet light technology in the facility, instead of the chlorination process used in other city facilities. Team Ford lost this one, though they might have won had more councillors been in the chamber when voting took place. 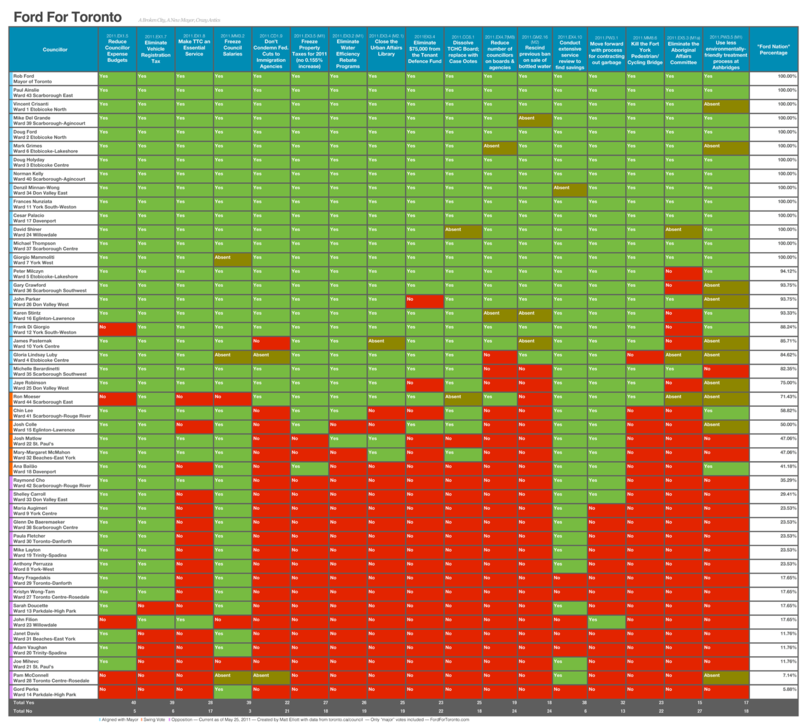 Only 13 councillors remain in the 100% club, having voted with the mayor on every major item. The are: Paul Ainslie, Vincent Crisanti, Mike Del Grande, Doug Ford, Mark Grimes, Doug Holyday, Norman Kelly, Denzil Minnan-Wong, Frances Nunziata, Cesar Palacio, David Shiner, Michael Thompson and Giorgio Mammoliti. On the other end of the spectrum, Gord Perks and Pam McConnell continue to share the crown in the anti-Ford club, with Perks holding a slight edge because McConnell has missed a couple of votes. This entry was posted on Wednesday, May 25th, 2011 at 2:38 pm	and is filed under feature. You can follow any comments to this entry through the RSS 2.0 feed. Both comments and pings are currently closed.